A new Leonardo is coming next to Palazzo Vecchio, Florence? An intriguing detective story about the Bella Principessa, a chalk-and- ink portrait, which according to some scholars could be attributed to Leonardo da Vinci. The mayor of Florence, Mr Matteo Renzi, would like to arrange it an exhibition next year, welcoming the young lady to Palazzo Vecchio, just as her noble status requires. 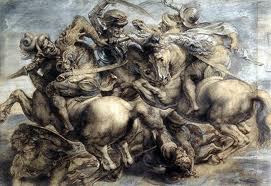 A silent possible dialogue between the two Leonardos in case of the expected discovery of the Battaglia di Anghiari, behind a wall in the Sala dei Cinquecento, in Palazzo Vecchio? Just these days a new book has been published by Martin Kemp, a renown Emeritus Professor of art history at Oxford University and by Pascal Cotte, founder of the Paris Lumiere Technology. The main character of the story, apart from Leonardo, of course, is a Canadian collector, Peter Silverman, who promptly bought the portrait under discussion in an art gallery, just after a glance. A shivering excitement. 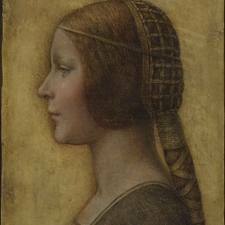 What struck him immediately was the Bella Principessa’s hairstyle and shape of her dress sleeves, recalling directly Leonardo’s “La Dame à l’Hermine” as to profile and sweetness. Might the painting date back to Renaissance? Was Peter Silverman one of the many Leonardo loonies? Many researches revealed that the young lady was Bianca Sforza, an illegitimate daughter of the duke of Milan, married in 1496 to Galeazzo Sanseverino, commander of the Milanese troops and patron of Leonardo. Bianca was about 13 years old at the time of the portrait. She was to die from an ectopic pregnancy. The dates coincide. The wellum on which it was painted was carbon-dated and it actually could be attributed to the period ranging between the first half of the 15th century and the seventeenth one. 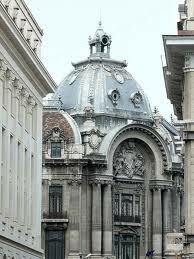 Besides, the portrait’s attire and the bound hair were fashionable in Milan late fifteenth century court. At that time Leonardo used to live there. The stitch marks of the painting’s edge found an answer after a research voyage of Kemp and Cotte in Varsaw National Library. They found in its collection the “Sforziades”, celebrative volumes for Bianca Sforza’s marriage. In one of them a Leonardo’s portrait was missing. Thence the painting’s stitch marks on the edge. It was a removed folio. La Bella Principessa was one off portrait, originally belonging to the books. However, the painting is still controversial. Some scholars are certain about its authenticity because of the way the hair is bunched beneath the strings, the distinctive left hand strokes just like Leonardo’s and the pensive expression, so much revealing Leonardo’s characters’ motion of mind. 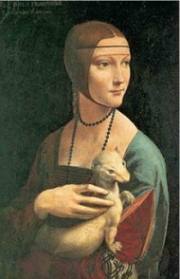 Others, more skeptical, hardly think that Bianca Sforza’s portrait will hang in a museum as a true Leonardo. Just time will be able to disclose the truth .